Join the 25,000+ others that receive AMAZING recipes in their inbox each day! It's FREE! 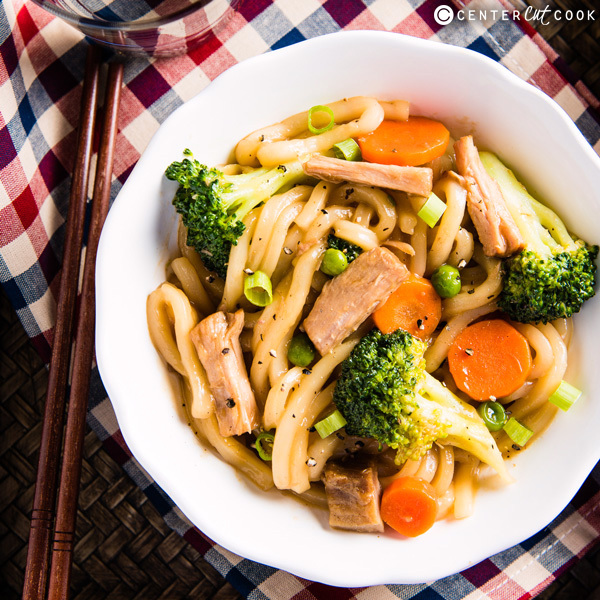 This Chinese chow mein is a super quick one-dish meal. It only takes 20 minutes to prep and cook, and it tastes a thousand times better than take-out! Stir fried noodles are a staple for my family and we cook them at least once per week. They’re easy to prep, allow you use up any leftovers, and are super fast to cook. Prepping and cooking chow mein is very easy once you get the jist of it. You can follow the steps below to help you speed up the workflow. First of all, heat up the stove and boil a big pot of water. This way it will ready when you finish prepping. For the prep, you only need to mix the sauce and chop up some veggies and meat. To make things even easier, you could use frozen chopped veggies and ground chicken or turkey, so you can skip the cutting part. Even better, if you have already cooked the Coca-Cola chicken recipe I shared earlier, you can scoop 1/3 cup leftover sauce to use in this recipe directly, without mixing the sauce yourself. As for the cooking, start by heating up the oil if you’re using an electric stove (it takes longer to heat up than a gas stove). Dump the frozen noodles into warm water for a minute and they’ll be ready to use. (I prefer to keep a few packs of these frozen noodles rather than dried ones, because they stay good forever and take less time to cook.) Transfer these noodles to a large strainer to drain. 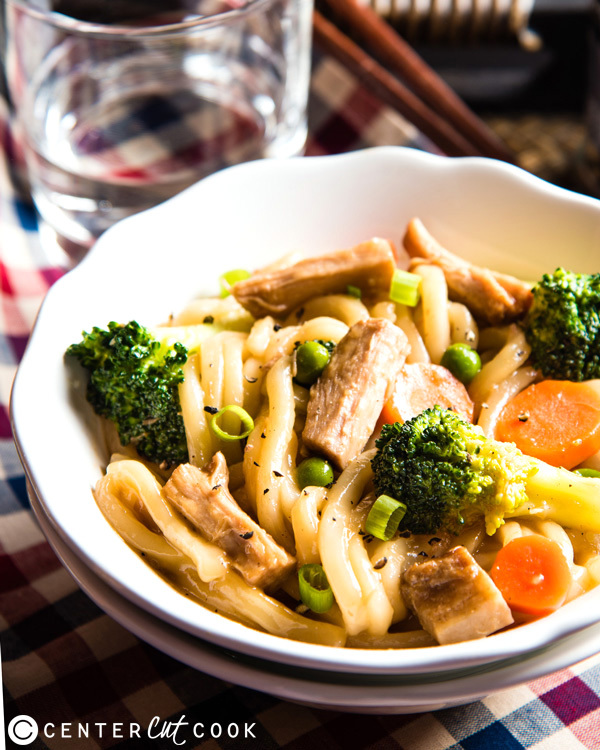 Keep the same pot of water boiling, so you can blanch the veggies for a minute, then dump them onto the noodles in the strainer to drain. Now your skillet will be hot and ready to use. Cook the meat in the herb-infused oil. Add the sauce and cook a bit more, then add the noodles and veggies. Continue cooking them for a bit until the sauce is fully absorbed. Then the noodles are done! I really like to use cooked meat in this recipe, because it helps you use up leftovers and it makes the dish taste even better. You can use stew or braised meat, boiled or grilled meat, or even sausage. I used smoked turkey to cook it once, and it turned out so good! If you don’t have any cooked meat on hand, use some ground turkey or chicken. This way it will be much quicker to cook and will taste great, even without marinating. And of course, feel free to adjust the ratio of veggies to meat according to your preference. I used more veggies in this recipe to make it healthier. That sounds easy enough, doesn’t it? Happy cooking! Need to convert the measurements? Click here! Bring a pot of water to a boil. Add frozen udon noodles. Cook until thawed, about 1 minute. Drain the noodles and set aside. In the same pot, add broccoli, carrots and/or frozen peas. Boil until almost cooked through, 1 minute. Drain the veggies and set aside. Heat oil in a large nonstick skillet over medium high heat until warm. Add green onion (or onion). Stir a few times until fragrant. (Option 1) Add raw ground meat. Stir and cook until cooked through, 2 to 3 minutes. Season with 1/4 teaspoon salt. Stir to mix well. (Option 2) Add cooked meat. Add stir-fry sauce (or leftover Coca-cola chicken sauce) and bring to a boil. Add noodles and blanched vegetables. Mix and stir with tongs until the sauce is absorbed, 2 to 3 minutes. Add black pepper to taste and serve warm. Need cooking temperatures? Click here! Ashley is the founder of CenterCutCook and a former teacher that now spends her days in the kitchen so that she can share her favorite recipes with you! Copyright © 2011-2019 CenterCutCook. All Rights Reserved.